Long-term investors know not to get caught up in the daily stock market gyrations. You set a plan and stick to it, with a little rebalancing along the way. But it's still useful -- and fun -- to see how investments perform over different time horizons. Take President Obama's time in office. It's been just over six years since Obama was sworn in during the midst of the Great Recession. Back then, stocks were tanking. Frankly, most investors were scared to touch just about any asset, although there was some bounce in safe havens like gold and silver. 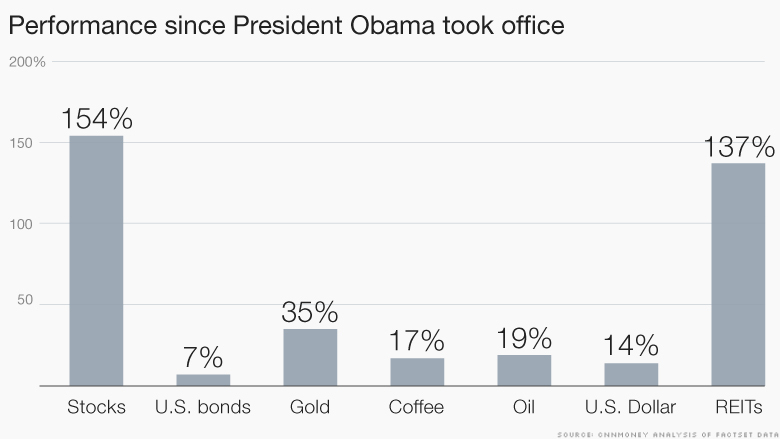 So which assets have performed the best so far in Obama's tenure? Best investment: Your gut inclination might be to say gold, commodities or even the U.S. dollar. But stocks are the clear winner so far under President Obama. The only other assets class that comes close is real estate investment trusts (REITs), which trade like stocks but are companies that hold office buildings, malls and other properties and make money off the rents. The stock market bottomed out in March 2009 and has been on an upswing ever since. In fact, we are in the midst of the fourth-longest bull market in U.S. history (and it could become the third longest if we make it to May). What's ahead? The question is whether this stock surge can continue. The market is once again within striking distance of setting new records. 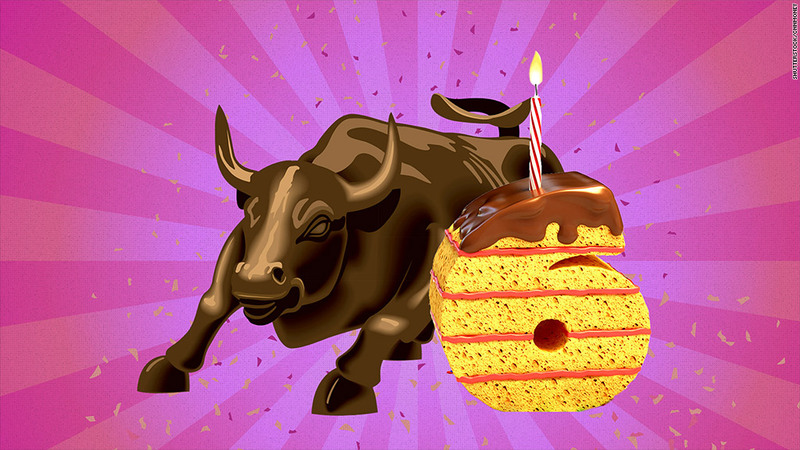 "We are advising our clients to continue to stay invested in equities," says Tracie McMillion, asset allocation strategist for Wells Fargo (WFC). "We think that because of the significant downturn that we experienced in 2008 and 2009, this particular bull market could have a longer run than average." While there's debate today over whether the stock market is getting too expensive, experts almost all agree that stocks are likely to give investors the best return over the next decade. Wells Fargo puts it this way: expect stocks to return 9% to 12% (not adjusted for inflation) a year, on average, over the next decade or so while bonds are forecast to return only 3% to 4%. Experts say it's typically best to stay invested, but it might be a good time to rebalance since stocks have done so well. As for REITs, this might be a good time to reassess. The phenomenal rise of REITs since Obama took office is largely due to the effects of the financial crisis. The fallout of so many bad mortgages caused real estate assets to sink dramatically in value. Since then, the property market has roared back, especially for retail spaces and office buildings. That said, as the Federal Reserve signals it plans to raise interest rates, the property market may start to look less attractive. Mortgages will become more expensive, and investors will have more options for yield. 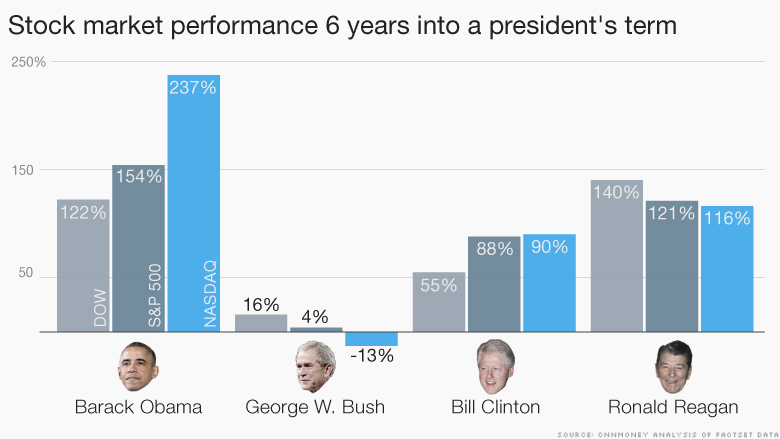 Obama versus other presidents: So how does Obama's tenure compare with other presidents vis a vis the stock market? The returns for the Dow, S&P 500 and Nasdaq haven't been anywhere near this good since the days of President Reagan. While many think of the dot-com stock surge under President Clinton, most of the wild returns happened in the last part of his tenure during 1999-2000. Six years into Clinton's time in the White House, stocks were up, but not off the charts. Related: Nasdaq near all-time high. Is it another bubble? Interestingly, six years into President George W. Bush's presidency, silver and gold were actually the best performing asset followed closely by REITs and oil. While the stock market has typically performed better under Democratic presidents, the reality is the commander in chief has limited influence on the market. "For most presidents, it's more about either good or bad luck in terms of how they show up in the financial markets," says Bill Stone, chief investment strategists for PNC Wealth Management. "Certainly [Obama] taking over after a horrendous market environment helped. It would be true of anyone after that. The market has always come back," notes Stone. As investors know, it's hard to know when markets will be up or down, but history continues to show that stocks do best over the long-term.